Another well known farming family in Mobberley in 1911 descended from Lee and Margaret who were at Mobberley Mill in 1841. Lee was a brickbuilder born in Stockport and Margaret was from Knutsford. They came to Mobberley around 1836 based on the birthplaces of their seven children. The family left Mobberley before 1851 where they are recorded in Heaton Norris. However, their son John stayed. He was born in 1827 and married Sarah Goostrey, moving to Moss Lane, Barnes Green, Barlow House Lane, Wood Lane and finally Sunny Bank before they died in 1902 and 1909 respectively. 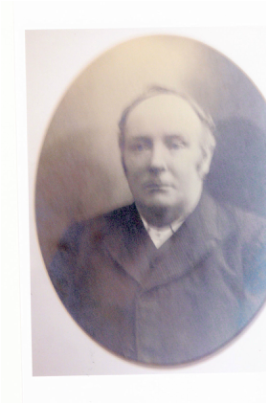 Their son John, born in 1856 married Annie Coleman and then Annie Gradwell, living at Bleakley, the only Clarkson family in Mobberley by 1911 but it is the Clarkson family of John and Maud's brother, William who married Edna Hough and farmed at Shaw Heath Farm that is best remembered in Mobberley. The Memorial Cottage in Faulkner's Lane was opened in their memory in 1924. When William retired, the eldest son, Percy and his family moved back from Newstead Abbey in Nottinghamshire. Percy's wife Margaret died suddenly in 1932 and he married Hannah Blackburn (nee Norbury, daughter of Betsy at Dairy Farm, Church Lane). These are photographs of my grandparents Mr and Mrs William Clarkson, who are buried in St Cross churchyard [Knutsford]. They farmed for many years at Pedley House Farm on the way from Mobberley to Ollerton. Out of seven children, five boys and two girls, one boy died in infancy, the rest grew up to be farmers. The eldest child was my father [Percy] and the youngest was a girl, born when my grandma was 45. She was Mrs [Edna Regina, aka Nennie] Redfearn from Mobberley, who died only a few years ago aged 95. My grandparents were attached to Mobberley (Wesleyan) chapel, where he played the organ (100 years old this year). The house opposite the chapel was built in Grandad’s memory (commemorative plaque still there) and remained as the caretaker’s house until this decade. It has now been ‘done up’ and is let out. The grandparents eventually moved to Shaw Heath Farm, which was then taken over by my father and I was born there. Grandad died suddenly at the age of 66 in 1917. Their sons had provided them with a very nice large-ish house just down the road from the farm, called Ardgour. Many of you will know it as Holly House Veterinary Surgery. The next house to the right was Annandale (Mr and Mrs Royle), then another big house (where Five Oaks is) occupied by the Hootons (Brown Owl and Tawny Owl). To the left was a large house (where the shop and post office now is) occupied by Mr and Mrs Lord, and on the opposite side of the road where Keoghs is was a house occupied by Mr and Mrs Tom Steel. The rest of the surrounding area was all fields and woodland. Ardgour had quite a large garden at the back, outhouses and stable, and a little meadow to the side. Grandma kept a cow, Nancy, probably some poultry, and a pony and trap (tub) for getting about, and I thought it a great thrill to go out with her in that. Although Grandma had worked so hard as a farmer’s wife and brought up a large family, I only knew her as a very slim, neatly dressed, gracious lady. She would look after me at Ardgour while my family were off to Mobberley Chapel on Sunday nights. I loved those evenings. The first thing we did was to go up to her bedroom, with some small lumps of coal, twists of paper and sticks in a little bucket. These were carefully laid in the grate and then the match was struck and put to the paper. In no time at all, there was a lovely fire going, and we left it to warm up the bedroom while we went downstairs. Often, to pass away the time, Grandmas would teach me little rhymes and poems. One was Wordsworth’s ‘We are Seven’. That had 17 verses and I thought it was lovely. At Christmas Grandma held a wonderful party for her many grandchildren. After a lovely tea and crackers, etc, we went into the big sitting room and as we all sat there expectantly, we suddenly heard the jingle of bells outside, and there was a tapping on the window. The front door was flung open and in came Father Christmas with his big sack. There was such excitement as he gave out a present for everyone and we all opened them. When that was over and Father Christmas had gone, we had DIY entertainment: recitations, singing, games. It was pure magic. The next day my mother sent along one of my big sisters to clear up after the party and I was allowed to go too, I rooted among the debris of crackers, orange peel, nuts, etc for little pictures and cards, any pretty things to stick in my favourite book, my scrapbook (there’s nothing like a scrapbook for triggering off happy memories). My grandma died at the age of 75, which seemed very old to me (by that time I was 8)*. 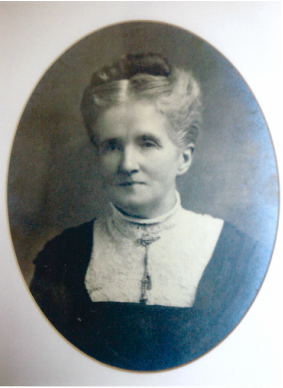 One of the things she taught me was her favourite hymn – long gone from any hymn book but so typical of the beliefs and faith of our forefathers. And glory, glory dwelleth in Immanuels’s land. And I never doubted that if anyone would go there it would be my good and gracious grandma. She was a wonderful lady who will always have a special place in my memory.